Summer is coming! Summer is coming! It may be a little snowy and a little cold now but soon enough the snow will melt, and kids will be looking forward to getting out of the classroom and into the outdoors! School is awesome but after a long year of learning, expanding their minds, and hanging out in a classroom, a long awaited break is needed. Time to get out and release some energy. 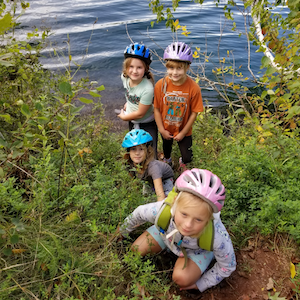 The Little Bellas Cuyuna Monday Program is a great way to get kids out for much needed fun and play! The Cuyuna Program Mountain Bike Program meets for eight select Mondays, late spring into summer at the Cuyuna Lakes Mountain Bike Trails. 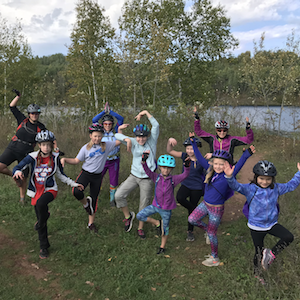 The program welcomes girls of all and any abilities to have fun, ride bikes, play games, and learn skills for mountain biking. It's main focus is to have fun! The goal is to create a fun, positive environment for the girls to build confidence and learn new skills. Whether it's riding the flowing trails or dropping into the pump track for some fun on rollers, Cuyuna Lakes offers a wide range of fun for all levels of rider. Lori's personal motto is, Make a Difference. What better way to make a difference then becoming a teacher and it's exactly what Lori did. And she loves teaching and helping kids learn, be it in the classroom or out on the trails. 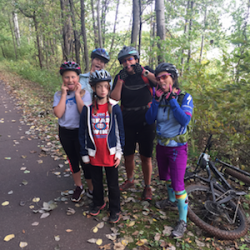 They moved to Cuyuna to be closer to their daughter and participate in all the outdoor activities her family loves. All kinds of riding, bike tours, kayaking (land of a thousand lakes), and nordic skiing (remember, MN, snow-a-plenty), anything to be outside. Now, this move to Cuyuna happened two years ago. In those two years, Lori has become a ride leader for the Cuyuna Lakes Mountain Bike team and is now starting a Little Bellas chapter! Imagine what she will do in 3 years! 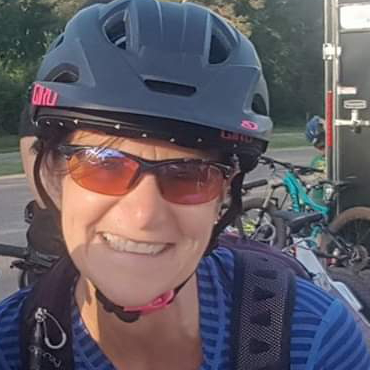 She felt so lucky to come into an area with such a large cycling community in Cuyuna when moving there and now she's helping to expand and grow that community. Making a difference she is!